Tired of riding someone else's version of a great mountain? Ready for the real thing? 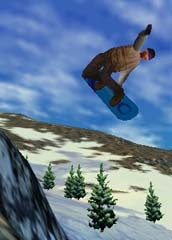 Soul Ride, Slingshot's first software title, is an extreme snowboarding game that invites you to test the limits in famous locations. Visit some of the toughest, most intense and spectacular snowboarding regions you can imagine. Using existing satellite world topography data, the Soul Ride engine immerses you in startlingly realistic environments, covering thousands and thousands of square miles. Using state-of-the art 3D rendering technology, you will experience visuals unlike anything you have seen before in a PC game. This is not a collection of linear tracks, this is an open-ended, virtual world which may be explored at your leisure, however you wish. Hit outrageous moves -- with a little practice you will be pulling varials, 1080's, rodeos and more off of backcountry heaven. 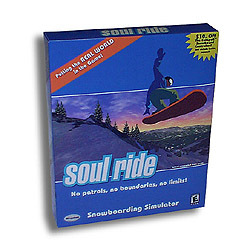 Whether you are a freestyler or freerider you will find your groove with Soul Ride. Refine your skills to take on courses of continually increasing difficulty, or take a helicopter, drop yourself on a remote summit and blaze your own trail. Explore endless amounts of the most realistic terrain you'll see this side of your monitor. And if all that isn't enough, you can further enhance the realism of the game by attaching a Slingshot Catapult to your PC in order to capture the physical experience of shredding on these amazing runs.